I'm so pleased that I now have 81 star blocks done out of the 128 that I need for the St. Anthony's raffle quilt that we will put in in October. I'm in a big rush to get the top done because it will be on display at the church on September 25th. 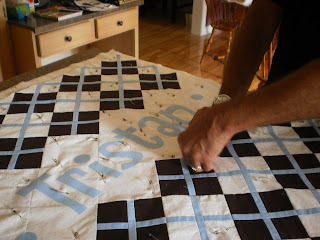 I'm hoping it will attract a few new hand quilters to our group. When I did my test block last week, I thought I had the math all wrong. It turns out my math was correct, but my measuring was wrong...oh, well, it was very confusing to me... but when I re-measured, they were right. We will be going to the cottage this week end, just for a day, and I don't plan on doing any sewing... But I do plan to take my 81 stars and square them up. I find squaring up, the least favorite part of making the quilt. How about you? Even, I don't know that..but come back on Sunday and I'll post where I am with my project. Hurricane Irene took our power out today. So, we started out our odd no-power day with Breakfast at McDonalds. We hoped that by the time we got home, that our power would be on. Nope, when we got home, it wasn't on..... So, we read Disney's Beauty and the Beast.... TEN times. Then we had a little lunch snack and read Beauty and the Beast 5 more times. Then we had a rest, a sleep actually. We hoped the power would be on by the time we woke up. A little later, while Grampie was hooking up the noisy generator to keep the fridge and freezer cold, Aurora and I went to the school park and stayed for an hour. We were hoping that the power would be back on when we got back... But it wasn't. And neither was the generator. Grampie had problems with it. It had been a long time since we used it. With everyone I know getting Kobo's for reading ebooks, I've been wanting a color eReader. I read more magazines than I do books, so I've been waiting to get something more suited to what I would use it for. I saw a color Nook at Barns and Noble when I was there last month. It was smaller than an Ipad, and it could do email along with many other applications. While this isn't a Nook, it is something very similar. I haven't done much with it yet, but 3.5 year old Aurora is learning how to play Gems on it. So far, she has the high score... I'll fix that when she goes home in a couple of days :)..
Well, I did get about two hours sewing/piecing blocks done on the church quilt so this afternoon I worked on a super small and simple project.. The other day, Natalia had listed some free tutorials for things to make for travelling. Well, with our Alaska trip coming right up, I couldn't help myself. Following this tutorial, I just had to make this double passport holder. I used my Canadian Themed fabric..and whipped this up pretty quick. I really like how the passport pockets are deep. I'm not sure what to put in the little lower pocket, but I'm sure I'll think of something. I'm making good headway with my church quilt. I let myself get distracted a bit this afternoon. I decided I wanted to make a couple of juicebags for a non-sewing friend who has two young children, 3 and 5. I only needed these for next Wednesday, so I thought to myself, I'll take the supplies and make them this weekend at the cottage. When I looked in my box of juicebag supplies, to my surprise, I had a few small juicebags almost all done. All I had to do was add the black binding around the edges, and the handle. So with my excitement I took out two and finished them in less than an hour this afternoon. If you want to make your own, click on the tutorial on my sidebar. Now I'm back working at the church quilt. I had mentioned in a previous post that I'll be making a Star quilt for the St. Anthony's Raffle Quilt. I have a deadline of Sept 23rd to finish the quilt. My plan is to have all 128 stars done by Sept 4th. That's less than two weeks away. I have been working all week on the planning the size, pulling/auditioning fabrics, cutting star parts. I started making some geese blocks on Monday and I've trimmed up some of them. Today, I have lots of star parts cut and ready to assemble an actual star. Just before supper, I finished block ONE! Now I have 127 to go. I did a measurement to see if my quilt math is spot on, and guess what. The block is 5.75 inches, not 6 inches. And so, how's your quilt math been lately? ﻿﻿Another year has gone by. Today we found ourselves spending this rainy day hand chopping veggies for our pickles. We only make two kinds now. Bread and Butters, and mustard pickles. The bread and butters are done and sealed. This is the easiest recipe ever!!! I shared it here on a post a couple of years ago. ﻿﻿ Tomorrow, we finish the mustard pickles. I love making pickles, do you? 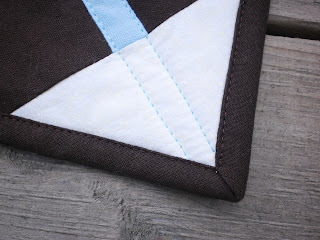 Advice needed on travelling with stitching projects! I'm preparing for a long trip. I'll be flying from the east coast to Vancouver in a couple of weeks to catch an Alaskan Cruise. Then, we'll be flying from Alaska back home. A total of 25 or 26 hours flying time both ways. I am not worried about stitching while I'm on vacation, and I probably won't have time. But the long flights and time spent in airports will give me some stitching time. In my new little embroidery take-along pouch that I made last week, I'm preparing to take a couple of the small blocks from my Winter Wonderland project with me. I know that I can't take scissors on the plane with me, so I'm taking my clover cutting disc necklace. But what I don't know is, can I take needles? I hope so. I plan on taking 10 thread loaded needles in my needle case with me. 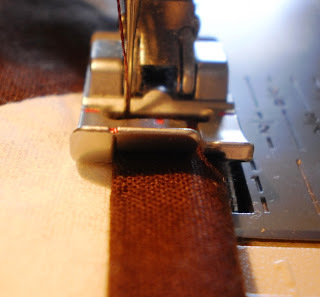 Do you have any advice on travelling with stitching projects? After a days rest from Grammie Camp, I loved sitting down at the machine to stitch. 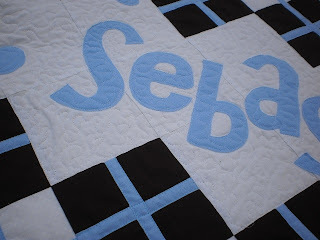 Finishing the baby quilts took longer than I thought.... Earlier this week, I was thinking that I can get them done in a day..... Well, in actuality it was 3 days. I tend to under estimate how long things take. Do you do that? If it was just the sewing part, ok.... but I seem to forget the time it takes to iron, to layer, to pin (and you know I'm a avid pinner), to trim, to square up, etc. 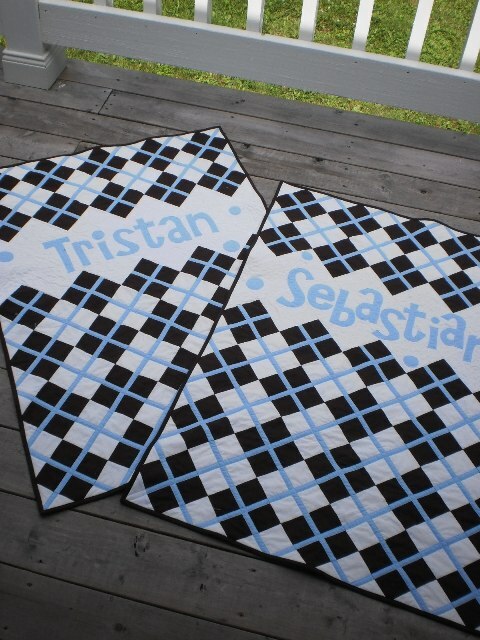 But they're done now and they'll be sent to newborns Sebastian and Tristan in Ontario this week. 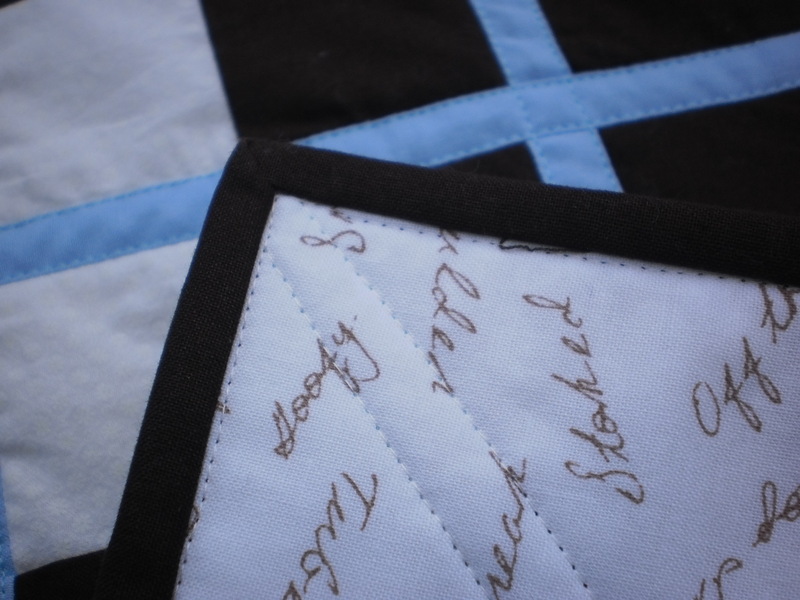 Here you can see that I free motion stippled in the white part and echo quilted around the letters of the name. Twice. Once inside the edge of the blue letters, and once just on the outside. For the argyle blocks, using my stitch in the ditch foot, and with the needle position moved over to the left a couple of notches, I simply top stitched on both sides of the light blue "X". It was pretty continuous to sew. 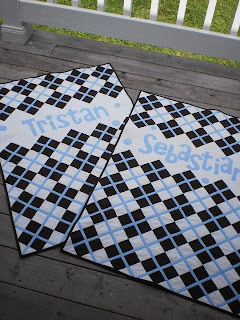 I love this pattern for a baby boy. It's by Natalia from Piece and Quilt. You can find the free pattern here on the Moda Bake shop. It's so modern looking. There is a similar quilt done in girl colors. I'm just itching for somebody to have a girl so I can make one in pink and browns. Grammie Camp is all done and we had a great time. Here is our official camp photo. 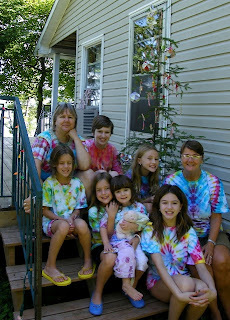 We're all wearing our new Tie-Dye T-shirts. We tried new techniques this year and the colors are richer and more vivid. Did you see our Charlie Brown tree in the photo. It was just sweet. We made beautiful crafty decorations to put on the tree, and it's really gave us a Christmasy feeling all week. I have many great photos, and I'll sort through them to show you some of the neat crafts we made. We had so much fun with Minute-to-Win-it games each evening. They were hilarious...and I think we should get the kids on the TV show. They are so good at these games, they would certainly win a Million dollars!! And of course I couldn't have done all this with out the amazing amount of help from my sister. Many thanks Auntie Donna! !You will never know how much I appreciate your help. Grammie camp finishes up today. This is the little patch, the kids will be sewing on their blankets today. 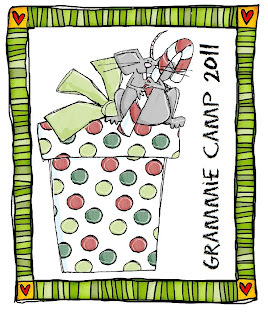 Since the theme is Christmas at the Cottage, how fun to have a cottage mouse with a candy cane featured on a present. I'll be back in blog land tomorrow with a fun filled update. 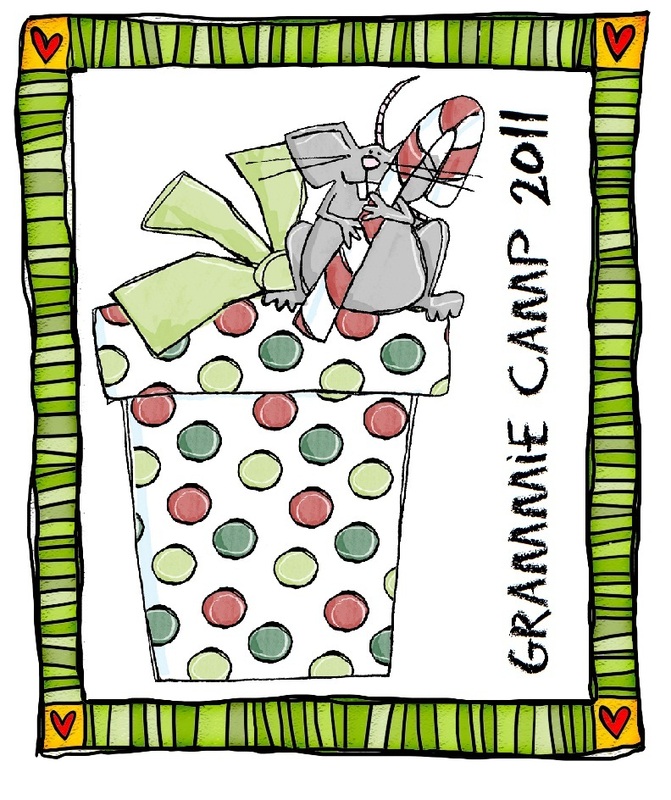 It's Grammie Camp week. 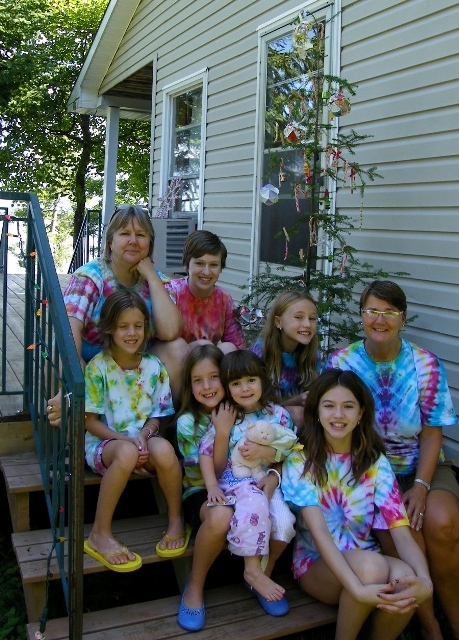 My sister and I are hosting Grammie Camp at the cottage again this year. The kids arrive this evening, and our programme starts tomorrow. With Christmas at the Cottage as the theme, you can just imagine the activities we have prepared for the kids. The kids now know the theme and have been practicing their Christmas songs for the past few days. We will be there until Sunday, so hang tight, and I bet I'll have some great photos to show you early next week. I was right yesterday when I said that this little project would take no time. I bet it took less than a hour. Half an hour was spent picking out fabric scraps that I could part with, if my project didn't turn out but if it did turn out, I wanted fabric I would enjoy. Like so many of my other "Prototypes", it's not bad and I like it. I think I'll use it. The size is about 6" x 8". It holds my on-the-go embroidery stuff with a little room to spare. I like that I can see inside the bag. 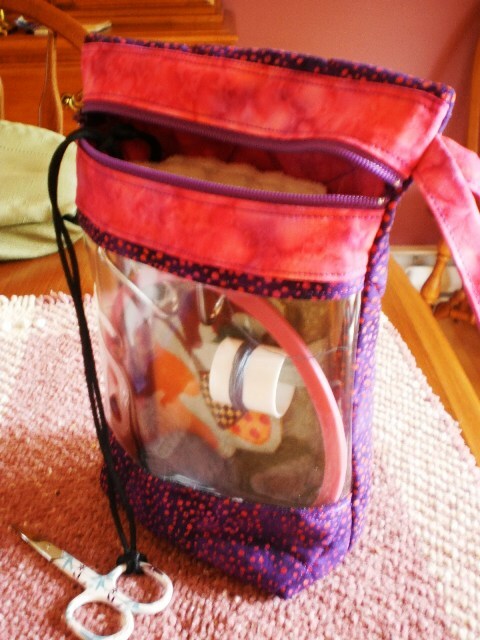 I'm always misplacing things, and I know that I try to keep my stuff in the bag when not in use. This will give me a quick glance. I used the Lazy Girl Designs take-along bag technique for putting in the zipper. I also used the LD technique to square off the bottom so it will stand. I put little loop inside so I can tether my scissors. 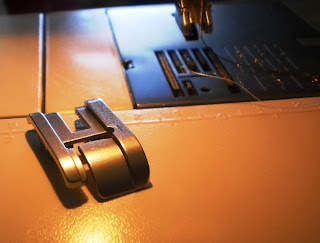 On more than one occasion, when I embroider on the deck, my small scissors drop between the planks wood. 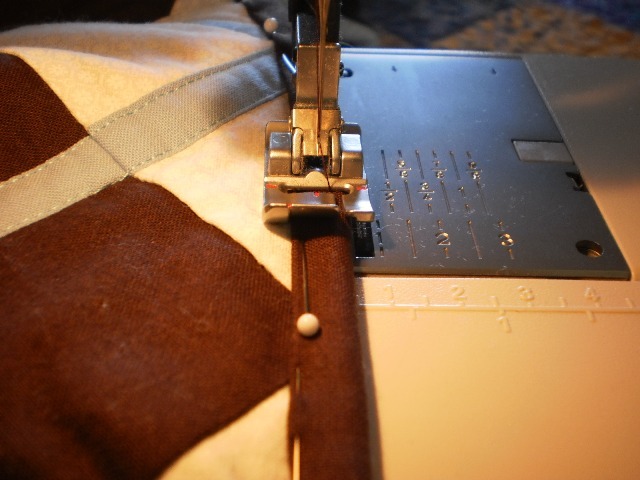 My intent was to have the zipper open from the other side, but you know.... when you are sewing something inside out, etc, it's easy to get mixed up. It was my intent to only post on Sundays in July about my Winter Wonderland, but since I have another block done, I thought I'd share it with you. Even though, I'm working on the largest block, I started this little block while driving in the car to Maine the other week. To my surprise, I found that I could stitch in the car. Not the friggy snowflake details, but the longer straight lines, were no problem at all. I found it made the long drive a little quicker. I'm about to hit a milestone. I'm almost done my first ball of DMC Perle 12 wt. I think I estimated to be 130 meters of thread on a spool. 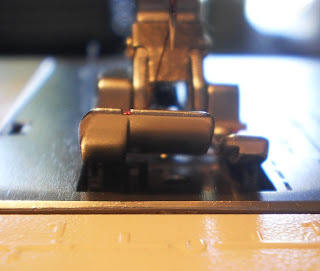 It gives a good idea how much stitching one can do with a single spool. I've been carrying all my stitching stuff it in a Ziplock bag. Not very elegant, eh? 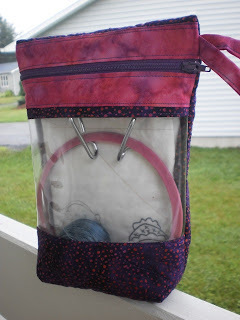 I have been thinking about making a little nice little carry bag or pouch that will hold my needle case, thread, small spring hoop and my "Piece". Having travelled back and forth to the cottage etc, over the past 6 weeks with my stitching ziplock bag, I now think I know what I want. And I can tell you that I've invested wayyyy more brain power into designing my carrying case, than it will take to sew it. I want it to be quilted of course. It should have an inside tag/loop to tether a small pair of scissors to. It should have a small wristlet type of handle. It should have a zipper, so the stuff won't fall out when it gets tossed about in my market basket or purse. I want to see into the bag without zipping it open. I want it small enough to throw into my purse. So, with all my requirements, and measurements in mind, I'll be pulling out some fabric scraps this evening and this will be my small project to make tomorrow. So, what do you carry around your stitching projects in? Mitchell designed is sleep pants this morning with me. He had originally wanted the front right and back left to be the same fabric, and the front left and the back right to be the other fabric. I thought I had the pattern pieces laid out right... but when we sewed the pants together they came out with both wrestling fabrics on the same leg, and the army/sports fabric on the other leg!!! How did that happen?? Well in response to my sad face., he said "that's OK" and we continued on. He's such an awesome boy. 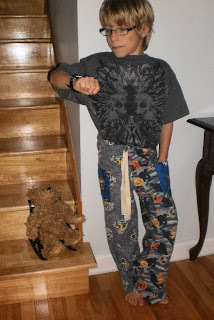 He designed his sleep pants to have two hockey side pockets on the front, and two hockey patch pockets on the back. They fit like a glove. He said they are so comfy and he loves them. Here he is doing the Uncle Kenny pose. You know, like the guys in the Sears catalogue... Cute Cute!! What!!! Linda has 400 posts already. Gesh, where is the time going? Drop by her blog here, and enter her give-away. 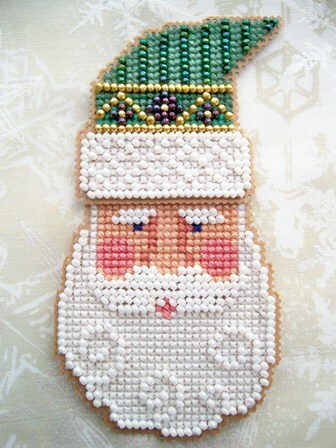 You might win one of these beautifully stitched Santa ornaments to put on your Christmas tree this year. Tell her Gail sent you! Good luck. It was Caitlin's turn today to have her custom made sleep pant made. I have two more pairs to make this week, then all the pink flannel should be gone. I have some fun wrestling fleece for Mitchell's sleep pants, probably enough for a few pairs!! While the girls were here, they were having a bit of fun while I was doing a little photo shoot of the sleep pants. These kiddos are really quite funny, don't you think!! Grace came for a visit today. She's been wanting to make some things for the SPCA. Well, my friend Charlotte who came over last week to make the magic bags left me some buckwheat to do with as I please. So since Grace knows lots about what the SPCA needs, we made 4 purple buckwheat bags for the little kittens who have no mother. You can see Grace here, filling up the bags with the buckwheat. The staff at the SPCA warm up these bags in the microwave and give comfort to the little animals. I also made covers out of left over sleep pants fabric for the bags, in case they need to be laundered. And since she was here, I measured her up and we made her a pair of fun sleep pants, very similar to what I made for Jessica and Emily last week. It's hard to tell, but she chose 6 different fabrics, and even designed the pocket so that the penguin's face is sticking up over the pocket. It's so cute. Tomorrow, Caitlin comes over to get her sleep pants made. I bet that after she chooses her fabrics, I can whip up her sleep pants in half an hour flat!! After that, it will be Mitchell's turn, then I'll make Baby Aurora a pair. Then after all that with the rest of the fabric, we'll make small cat quilts for the SPCA.